Monday, February 17 1908 -- Jimmy Britt and Battling Nelson are both training in L.A. for their upcoming match, and Herriman seems to have little respect for Nelson's chances in the bout. 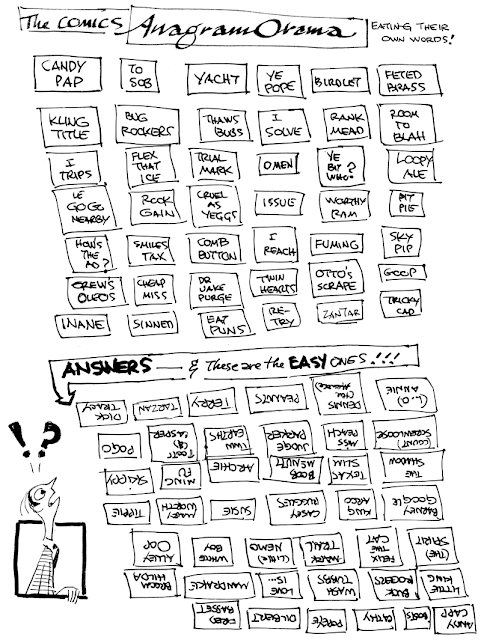 H has a little duck conga line going on at the lower left; nothing to do with the rest of the cartoon, but fun! Paul F. Brown was born in Concord, New Hampshire in the early 1870s, either in 1871, according to a New York Times obituary, or in 1873 as recorded in the 1880 U.S. Federal Census. According to the census he lived in Concord, New Hampshire at 179 State Street, with his mother and maternal grandparents. The fate of his father is not known. His grandfather was a blacksmith. Information about his education and art training has not been found. The date of his move to Boston is not known. He was listed in the Boston Directory 1892-1893, found at Ancestry.com, "Brown, Paul F. artist, 246 Wash. bds. at W. Medford". The Times obituary said, "He started his career as a newspaper artist in 1898 with the old Boston Record, where he made chalk plates, once used in reproducing sketches. He also worked part-time for The Herald here. Later he became a Herald staff artist, serving for forty years until his retirement five years ago….He was a former president of the Boston Press Club and for many years was a member of the organization's board of trustees." Brown has not been found in the 1900 census. The Boston Directory 1900 recorded this entry, "Brown Paul F illustrator 246 Washington, rms. 33 [Hancock]". The Boston Herald reported the Boston Press Club election on March 15, 1901. He was unanimously elected president of the press club in 1903 as reported in the Boston Journal on March 13. According to the Times obituary, Brown married Anna in 1904; it was his second marriage, as noted in the 1910 census. The census said the couple lived in Boston, Massachusetts at 85 Pinckney Street. His occupation was illustrator at a studio. The Times said, "Mr. Brown during the first World War was in charge of the Navy's camouflage division at New Orleans, where he directed the camouflaging of ships." The 1920 census recorded the couple in Boston at 29 Rosseter Street. The Boston Directory 1920 had this listing, "Brown Paul F commercial artist 170 Summer rm 416 h at N Weymouth". He has not been found in the 1930 census, but he was listed in the Boston Directory 1930, "Brown Paul F art dept 171 Tremont h 11 Everett Camb". The 1939 directory identified his employer, "Brown Paul F (Anne I) art dept Herald-Trav r 902 Beacon"; he worked at the Herald-Traveler. The Boston Directory 1944 had this entry, "Brown Paul F administration dept Herald-Trav r W Gardner Maine". Brown passed away, after a long illness, on December 8, 1944, according to the Times. 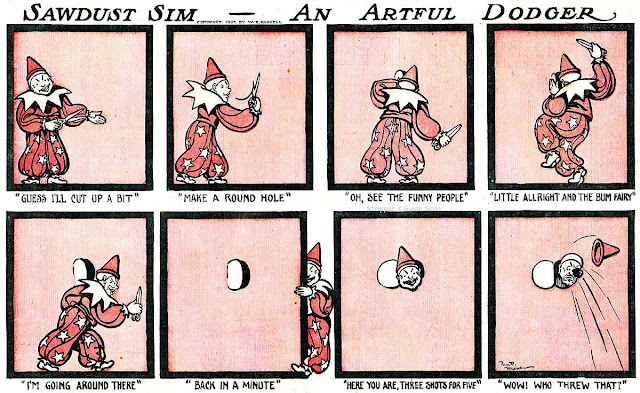 One of the few real gems in the Boston Herald's comic section of the 1900s was Sawdust Sim. Most of the Herald's Sunday comics were reasonably well-drawn but the writing was almost uniformly execrable. Paul F. Brown's Sawdust Sim was, in stark contrast, not just well-written but also quite avant garde. 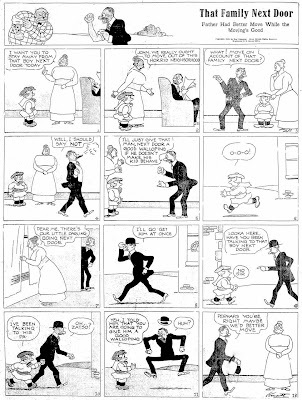 Strips that broke the fourth wall in those days were quite rare, but Brown's strip used that motif every week in ways that still seem quite fresh today. Brown had the good sense not to overdo the strip, and it ran for only about four months, from November 18 1906 to March 10 1907. It was one of only two comic strip series he is known to have done. That's brilliant. Are there any deeper archives online? Jean Knott was born in St. Louis, Missouri on June 15, 1883, and was educated in St. Louis public schools, according to Who Was Who Among North American Authors, 1921-1939 (1976). He has not been found in the 1900 U.S. Federal Census. Who Was Who said Knott was on the St. Louis Post-Dispatch staff from 1903 to 1916. According to the 1930 census, he married when he was 23 years old, which was in 1906 or 1907. He and wife, Bettie, lived with her parents and three siblings in St. Louis at 3314 Shenandoah Avenue, as recorded in the 1910 census. He was a newspaper cartoonist. Cartoons Magazine, April 1916, reported Knott's new comics panel. Gene (sic) Knott, sports cartoonist on the St. Louis Post-Dispatch, has been drawing a series of poker cartoons entitled "Penny Ante." They have the earmarks, it is said, of having been inspired by one who knows, and according to an unidentified rumor, Knott is contemplating submitting to his business office at the end of each week an expense account to cover losses while engaged in getting raw material. 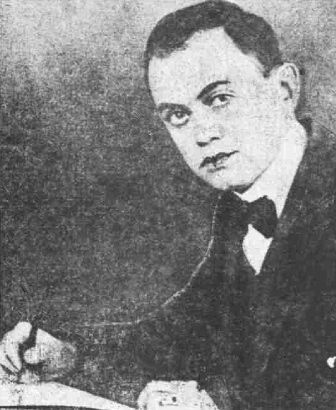 Three months later Cartoons, July 1916, reported his new contract. 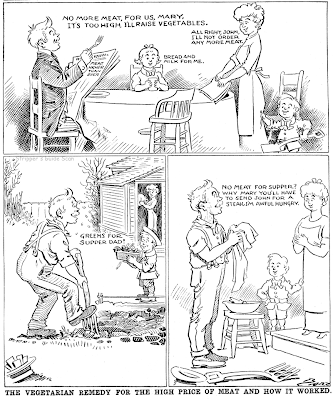 Jean Knott, comic artist of the St. Louis Post-Dispatch, has been graduated into the big-league newspaper class through signing a contract with William Randolph Hearst to work for the Hearst newspaper syndicate. His salary will be $12,000 a year, of considerably more than double his present salary. He began on the Post-Dispatch as a counter clerk at $10 a week. His work recently attracted attention of Hearst, who signed him to a two-year contract. For several years Knott divided his time between St. Louis and New York City. Columnist O.O. McIntyre said, on July 18, 1937, "He lived for several years on Riverside Drive, where a penny ante poker game, from which he got so much of this material, was in full blast almost every evening." 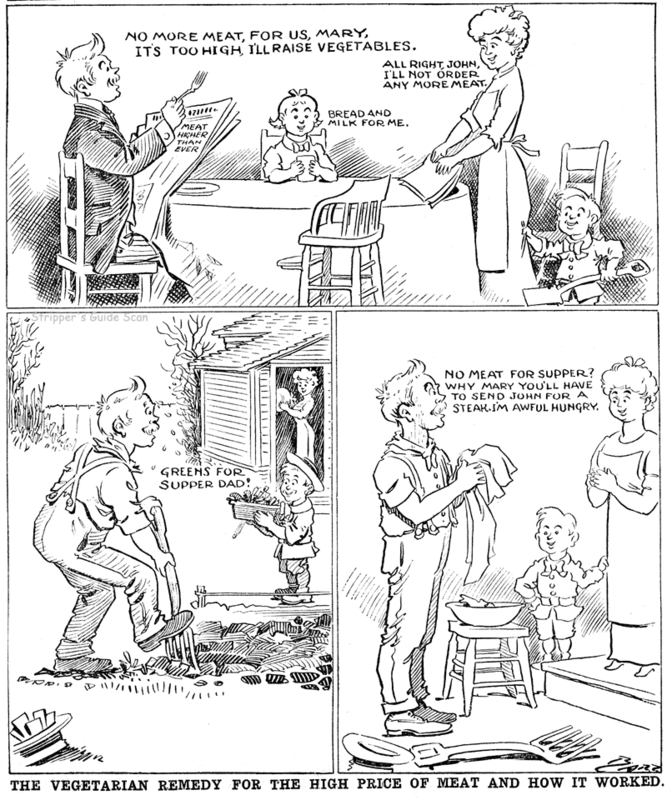 Another strip by Knott was That Family Next Door, which was, later, renamed Mamma's Boy. He signed his World War I draft card on September 11, 1918. His occupation was cartoonist for the International Feature Service, and description was tall height, medium build, and brown eyes and hair. He named his wife as his nearest relative; their address was in St. Louis at 3129 Shenandoah Avenue. They soon divorced. Knott and second wife, Elizabeth, lived in St. Louis at 6300 Enright Avenue, according to the 1920 census, which was enumerated in January. She had a nine-year-old daughter. He was a newspaper cartoonist. The Kansas City Star (Missouri) published news, from the St. Louis Post-Dispatch, of his wife's divorce suit on May 22, 1920. Who Was Who said Knott married Winifred Wall on February 21, 1921. In 1930 the couple lived with his mother and sister in St. Louis at 3129 Shenandoah Avenue. He continued as a newspaper cartoonist. On July 18, 1937 O.O. McIntyre said, "Later, he went to his country home near St. Louis and dropped his cartoon idea for an advent in commercial drawing." Knott passed away on June 5, 1937 in St. Louis. Two days later the New York Times published the Associated Press item. St. Louis, June 6 (AP).—Gene [sic] Knott, artist and creator of the "Penny Ante" cartoons, died at a hospital here yesterday after a brief illness. His age was 54. He formerly resided in New York, where he was employed by a syndicate service, but recently had been doing commercial advertising illustrations. Wow, this blog is really awesome! Thanks for posting all of this Comic Strips stories! In the mid-teens, some weekday Hearst strips suddenly sprouted companion features. These features were meant to be used sort of like the Sunday toppers of a decade later -- if the paper didn't have the space they could be lopped off. An extra benefit of these daily ones was that the companion feature could be clipped off and run elsewhere in the paper or as ROP, a nice little boon to page composition. Jean Knott's Penny Ante (aka Eddie's Friends) used these weekday companion features much longer than the other Hearst bullpenners. 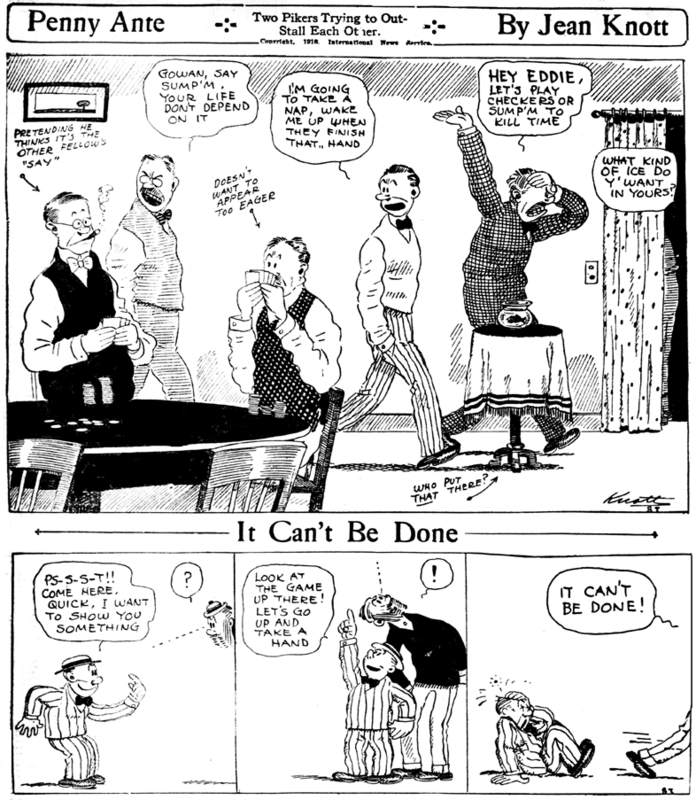 The first companion strip to it was It Can't Be Done, an unassuming feature that used the same tagline every day. Although the temptation is to say the idea was too limited to last, the strip is rather like There Oughta Be a Law and They'll Do It Every Time, so I guess no idea is so limited that someone can't flog it for decades. Knott included It Can't Be Done with Penny Ante from June 13 to September 25 1916, and then replaced it with Let the Wedding Bells Ring Out, a companion feature that proved popular enough to also run on its own for many years. Thanks to Mark Johnson for the samples! 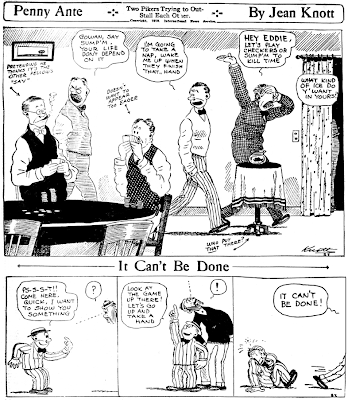 It Can't Be Done was seen in the Chicago Examiner as late as 11 October 1916. Dates are based on the New York American, the 'paper of record' when it comes to this strip. Without doing a comparison of when each paper ran the strips I'm sticking with my date. It is not uncommon for syndicated material in the 'teens to run late outside its home paper. "Charles Lewis Bartholomew" is the notation entered on the records of Lucas county, Iowa, indicating the birth of a son to Colonel Orion Alexander Bartholomew and Mary (Smith) Bartholomew. The entry was made on the 10th of February, 1869. To the reader of the daily newspaper and the political magazine, however, the man who has been the creator of so many striking political cartoons is known at "Bart." But Bart is not known alone to those who find a happy flash of humorous treatment in a picture editorial. Hundreds of audiences have listened to his famous chalk talks. And many hundreds of men and women, acquiring the fundamentals of illustrating, recognize the well known signature at the end of kindly letters of instruction and criticism which they receive from him as dean of the Federal School of Illustrating and Cartooning. Bart went to the Iowa State College long enough to take all the mathematics that But writs of replevin and restraining orders held no interest for Bart. When his mother read to the family group, Bart would illustrate the action of the story with charcoal sketches. In the school room when the going became too slow for his active mind he relieved the tedium by drawing pictures. Bart's idea of doing something, however, was running a newspaper, and at the age of seventeen, his father, having acquired the Chariton Herald, gave him the chance to be its editor and guiding genius. It is said of him that in the full burst of his editorial dictatorship he slammed a story of the local discovery of a coal mine into the back page and ran the first page full of locals. In other words, he played up the human element. Bart went to Iowa State College long enough to take all the mathematics that an engineering course could give, acquired a Bachelor of Science degree, a captain's commission in the Iowa National Guard, Henry Wallace, secretary of agriculture as a roommate, and the acquaintance and good will of Miss Ella Louise Henderson of Monticello. Miss Henderson and Bart were married on the 17th of June, 1890. Three sons have been born to them: Orlo Alf, Robert Henderson and Charles Lewis, Jr. Shortly after graduation Bart began newspaper work as a reporter in Minneapolis; he became staff correspondent and later cartoonist. For a score of years he was in active management of the art department of the Minneapolis Journal, with front page cartoons on political subjects and current events. Bart has the distinction of being a pioneer in the newspaper cartoon field, not only in the Northwest but in the country at large, the Journal being one of the first papers in the United States to use the daily cartoon feature. Bart literally created the department in which he has made a name. His idea met with immediate success and has grown from year to year until today Bart's cartoons are known around the world, and the Journal and Minneapolis are familiar names to many abroad who otherwise might never have heard of them. A contemporary writer, James Gray, at one time mayor of Minneapolis, said of Bart: "In this long period of twenty-five years he has drawn daily cartoons, missing very few days of publication, an enormous drain upon the invention of any man, no matter how prolific. Bart draws cartoons as the editorial writer writes articles, from the news of the day. He is an editor in outline. His cartoon is a first-page editorial, couched in the most telling phrases and simplest grammar." Bart's cartoons in the Journal have been reproduced in every part of America and in England and European countries, by many daily papers and magazines. Even in far-off Australia they are frequently reproduced. In his book, "The Americanization of the World," W.T. Stead says: "One of the most capable cartoonists in the United States is Mr. Bart of the Minneapolis Journal." 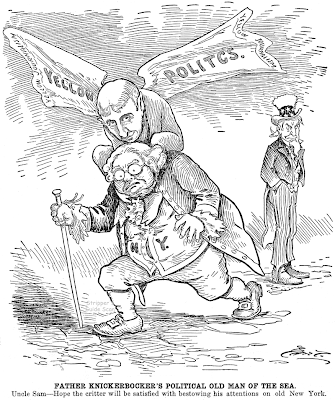 In this book and also in Mr. Stead's magazine, The European Review of Reviews, Bart's cartoons have appeared more frequently even than in the American Review of Re­views, whose editor, Dr. Albert Shaw, says: "The esteem in which the Review of Reviews holds the political cartoons that appear in the Minneapolis Journal is sufficiently shown by the frequency with which it has reproduced them. Mr. Charles L. Bartholomew of the Journal, whose work is signed 'Bart,' has not merely a very ingenious and ready pencil, but he has a remarkable political instinct that makes his drawings to a very unusual extent valuable as elucidating the situation or reenforcing an editorial position or point of view." For a period of fifteen years, the American Review of Reviews, Literary Digest, Current History, and leading metropolitan magazines used more cartoons from Bart's pen than from that of any other artist. 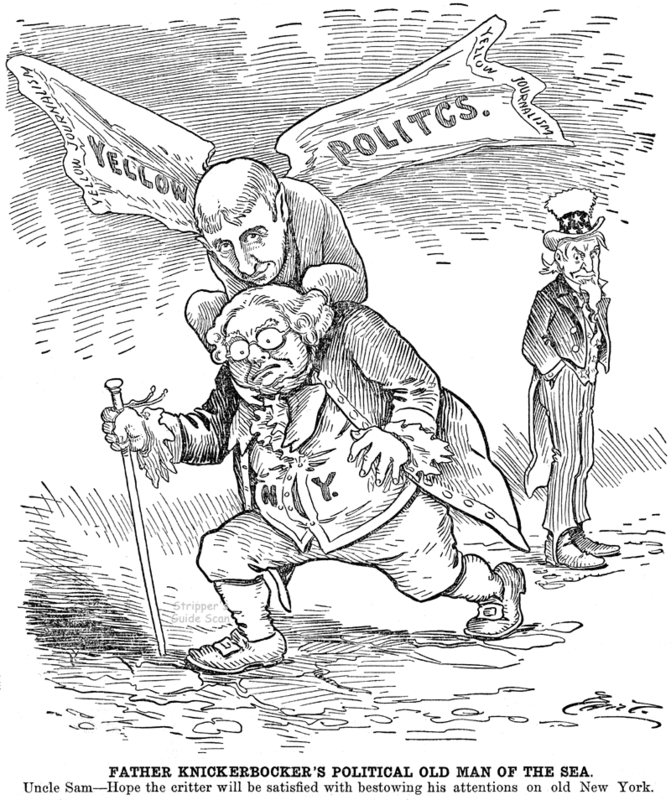 His cartoons were compiled annually in "Pictorial History of World Events" for a similar period. Rand McNally & Co., published six books of juvenile caricature illustrated by Bart. Of the wonderful advertising value of Bart's cartoons, B.O. Flower, the editor of the Arena, has said: "We doubt if even the management of the Journal fully appreciated the enormous value of Bart's work in familiarizing the reading world at large with the name of his paper. 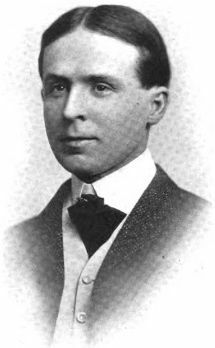 In the 1922-1923 edition of "Who's Who in America," Mr. Bartholomew is credited not only with ten volumes of current cartoons for the Journal and illustrating six juvenile books by W.A. Frisbie, published by Rand McNally & Co., Chicago, but also with twelve textbooks on "Illustrating and Cartooning" for the Federal Schools, Incorporated, Minneapolis, and his new book on "Chalk Talk and Crayon Presentation," published by Frederic J. Drake & Company of Chicago and the Bart System and Basic Stunts issued by Bart Supplies. Bart has used his crayon continuously for high school and college audiences and in lecture work and entertainment. He is the editor of a complete and com­prehensive system which has served as the basis for many a chalk talk artist and lecturer using crayon presentation. 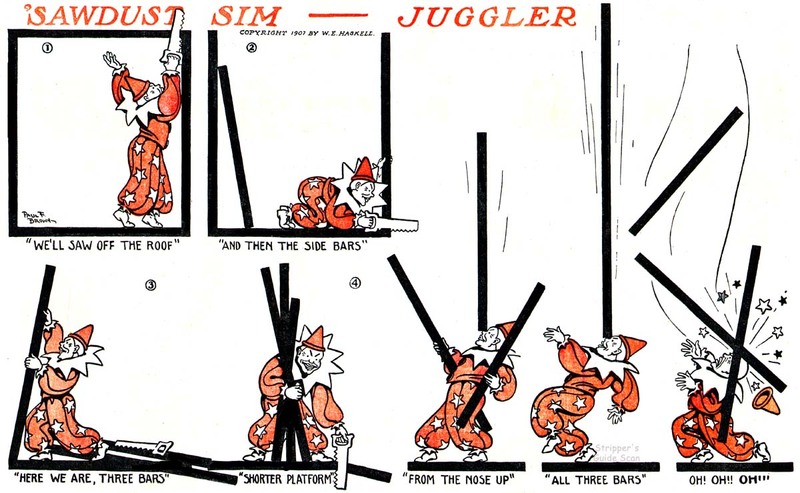 In compiling information for student use in illustrating and cartooning, he puts in practical form, information from the highest sources among the modern illustrators and cartoonists, using his ability as reporter and editor, rather than depending alone upon his own individual experience. His strength in educational work lies in his ability to secure from these practical sources, latest methods used in the reproductive art. He is recognized among members of his profession for originality in clear presentation of practical requirements of the illustrator and cartoonist. In his political views Mr. Bartholomew is a stanch republican and through his cartoons has wielded great influence in party affairs. His religious faith is that the Congregational church. He is identified with Plymouth church of Minneapolis, where he holds the office of church clerk. In an address given at a banquet in Bart's honor by Minneapolis business men, at the end of twenty-five years of editorial and cartoon work, Dr. Harry P. Dewey, pastor of Plymouth church said that if Mr. Bartholomew's services were available he would choose him as assistant pastor because of Bart's able assistance in popularizing the vesper services conducted by the church. His chalk talks before factory workers, business organizations, schools and colleges have brought him, throughout his career as cartoonist and editor, into personal contact with his readers. Mr. Bartholomew is Dean of the Federal School of Illustrating and Cartoon­ing and at the present time is devoting his entire attention to editing textbooks and conducting instruction in the course in Illustrating and Cartooning, in which some ten thousand students are studying practical drawing by correspondence. The students are from every English speaking community in the world. Hi, This is my uncle!! !